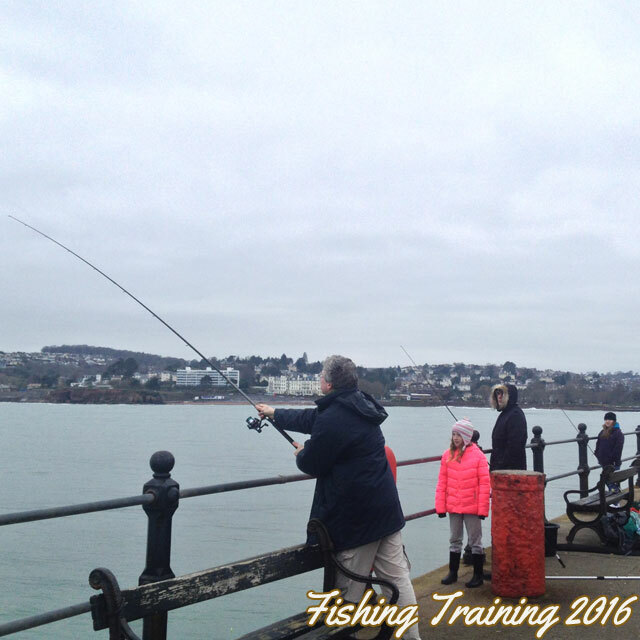 THIS TRAINING RUNS ALL YEAR ROUND! Want this for a Birthday or Christmas present? Click here to see my gift voucher. 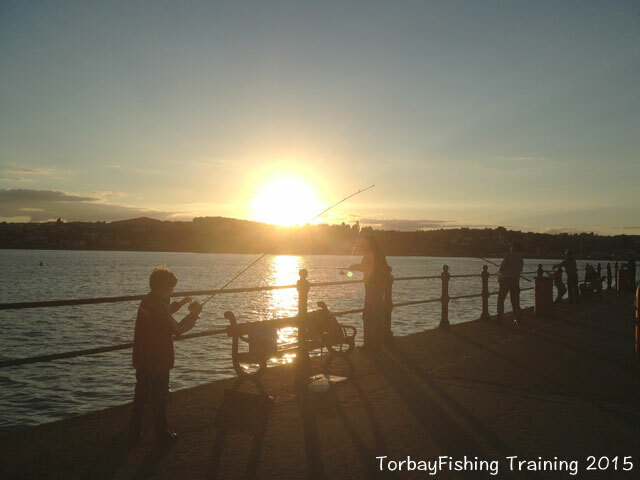 Have you ever wanted to take up beach or pier fishing but have no idea where to start or what to do? 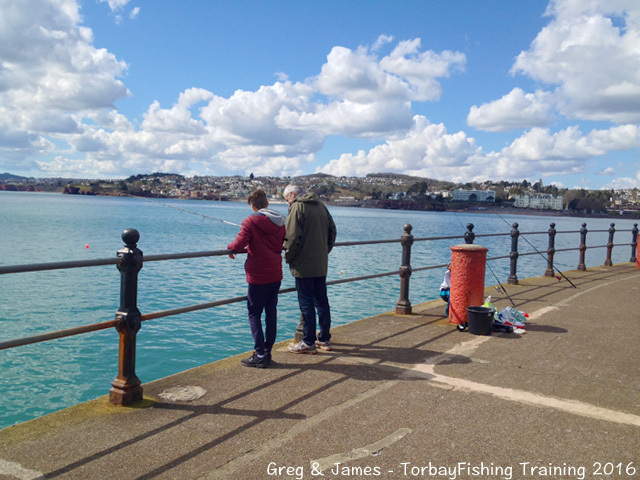 Learning to fish can seem quite daunting but it doesn't need to be if you have a relaxed, friendly person to coach you. I supply EVERYTHING you'll need! If you have no equipment it doesn't matter. 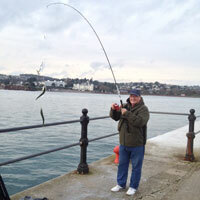 I will supply rod, reels, feathers, floats etc. You can bring your own equipment if you want to but I have everything we'll need. The only thing you'll need to bring is snacks and drinks to keep yourself going. You also need to bring WARM clothing! Even in the summer it can be cold by the water with the wind chill! 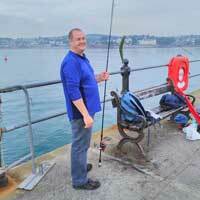 While we are fishing I can offer you advice on what equipment you'll need. I don't sell ANYTHING so any advice I give you is completely unbiased and independent! When would this training take place? I offer this all year round. I can train any day or evening except Saturdays. The training is tide and weather dependent. I'll keep in touch with you and we'll discuss the predicted weather a day or two before we meet. I charge £45 per head (maximum of three people) for a 3 hour session, This covers any lost feathers, weights and so on. 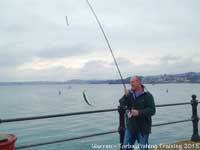 There are NO costs for anyone with you who won't be fishing. 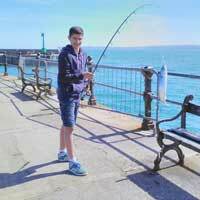 Children under 18 must have an adult accompany them. 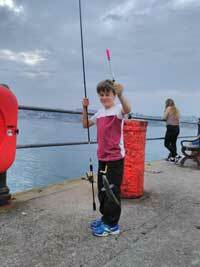 If they are under 10 the training won't include feathering due to the amount of hooks on the line. I have a current and active DBS certificate which can be shown upon request. I've taught someone who was 72 so you're never too old to start! 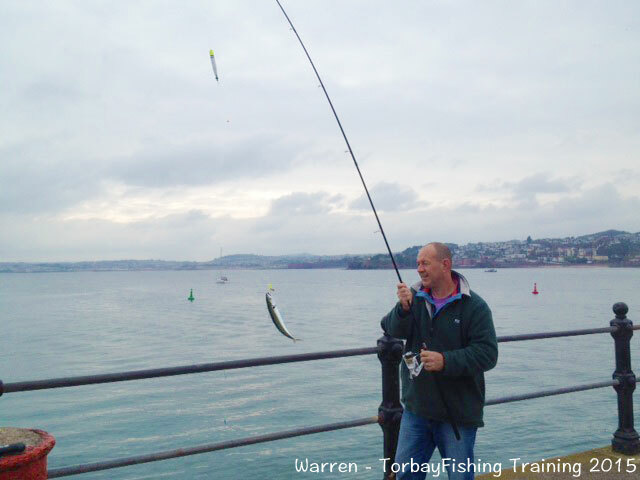 I operate a 'catch and release' policy on ALL fish that won't be eaten or used as bait. 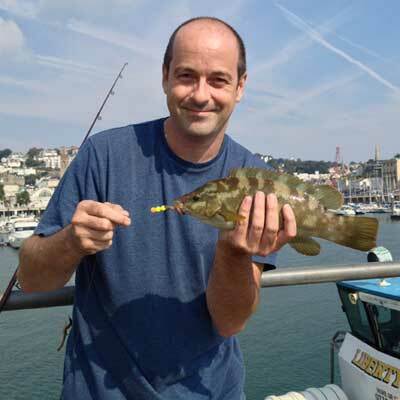 I will however take photos of you with your catches as a memento. It will most likely be from Goodrington Promenade in Paignton. 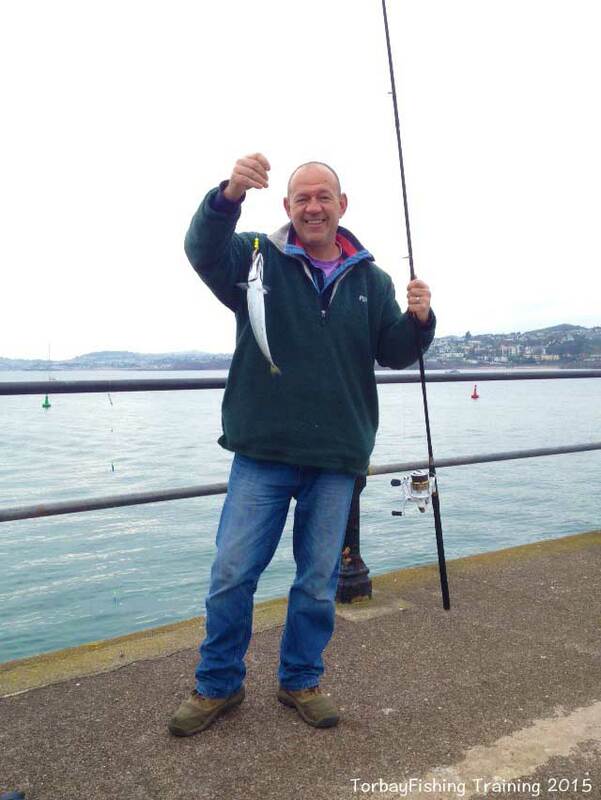 For some parts of the year it may be from Princess Pier in Torquay. 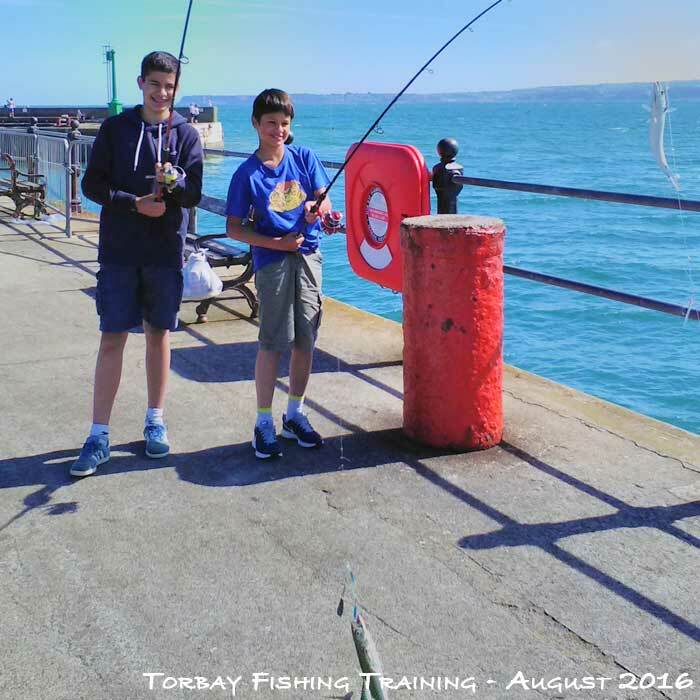 Both of these fishing spots are great because they are the most child friendly places to fish and it's rare to get snagged on anything. This is the perfect Birthday present or Christmas present for the person who has everything! Each Gift Voucher is tailor-made to you and the person you are giving it too. Each voucher will have your name, their name and the message you wish to have on the voucher (click on image above for an example). The voucher will be emailed to you in an image format so you can then text, email or print it yourself. Because this voucher is bespoke to you, please allow 24-48 hours for the voucher to be emailed to you. 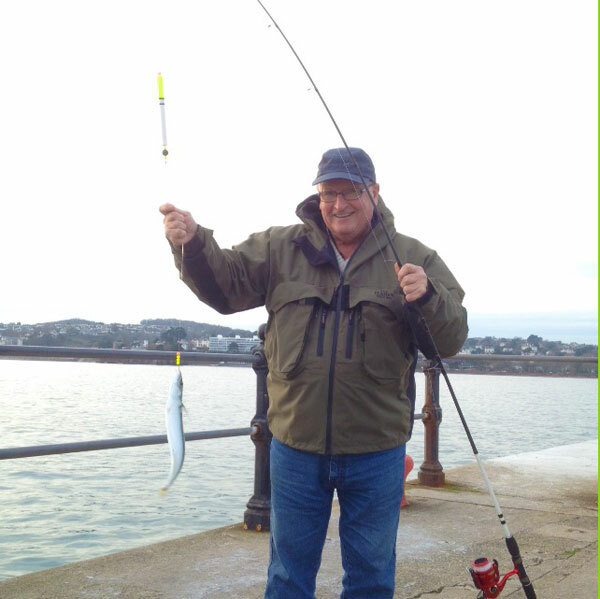 Me with an unusual catch for Princess Pier, Torquay. I started fishing in 1986 and I've fished all the fishing spots listed here many, many times. I am super friendly and I promise I won't be technical. Nothing I show you will be too complicated. You will learn a LOT in the time we are out. I think all the smiles say it all! Had a great day doing the training with you, I learnt a lot and will definitely be out on my own asap. Thank you so much for the invaluable information. Thank you so much for today! I had such a great time and am planning to go fishing in the same place next Sunday to practice everything you showed me. I'll send you a photo if I catch one. 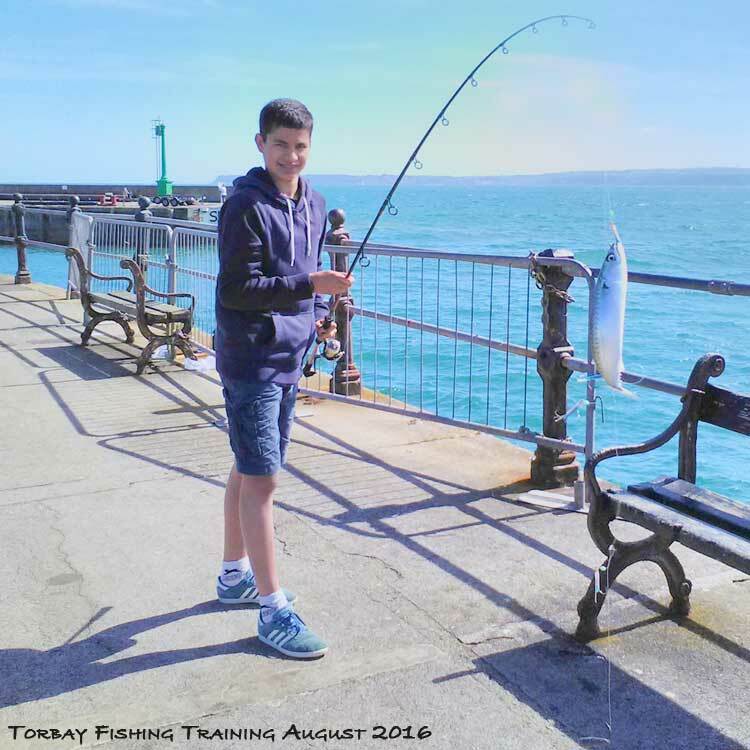 I learned so much and feel really confident that I can go fishing now without worrying. Good pictures of a really enjoyable experience, thank you very much. I shall forward these on to my eldest Tom, just to make him jealous! Thanks again for the lesson and I expect you will see me on the pier sometime. 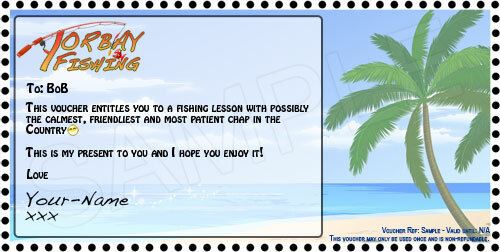 Robert and I just wanted to thank you for the fishing training yesterday. In spite of the blowy conditions we both enjoyed it and feel that we learnt a lot. We now want to get a rod etc for next summer so perhaps we will be a bit luckier with the mackerel then. Home and fish on the grill Thanks to you ! We had a ball - the boys said it was better than expected and it wasn't as hard as they thought. 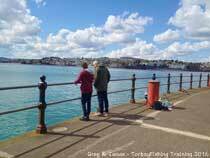 We both enjoyed the experience and instruction so much so we returned the following day to the same spot. Can't think of any way you could improve other than what you have already thought of yourself and to ensure people bring warm clothing. I felt today's lesson was really useful and achieved everything I had hoped for so thanks again. 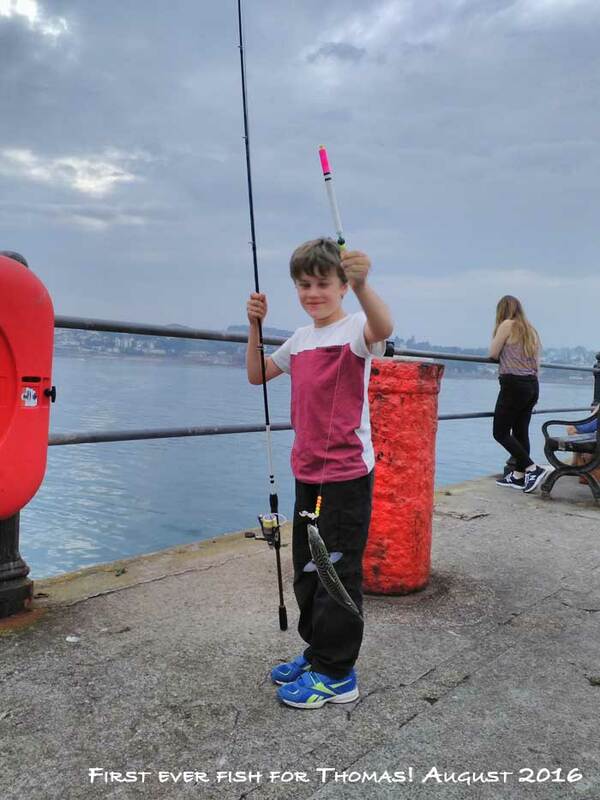 Thanks for a good day out fishing. We learnt a great deal. 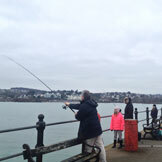 I really enjoyed the fishing experience today .. Thank you very much! 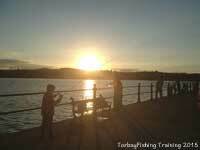 We both enjoyed meeting with you and if we are visiting Torquay again we will look u up. The pic of Tony was lovely and he was very pleased. 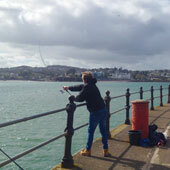 We will be by the water and we'll be using fishing hooks which are sharp objects so there can always be potential risks. You need to know your capabilities and you must mention anything that is relevant (like not being able to swim). You must also make it very clear if you don't understand something . 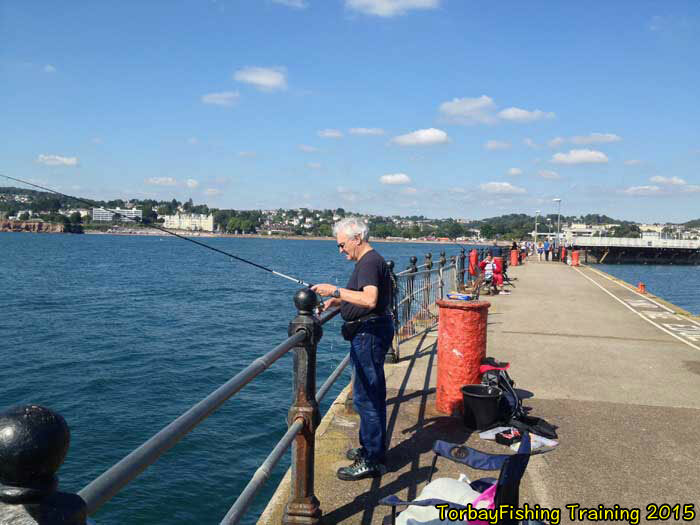 As an example, I will show you the right way to cast but if you don't think you can do it you must tell me before you cast as I can show you a safer way of casting. I have not had a single accident or incident since I started doing this but we all need to be aware that they can happen, as they can happen with any sport. All participants must understand that sports of any nature can be a dangerous activity. 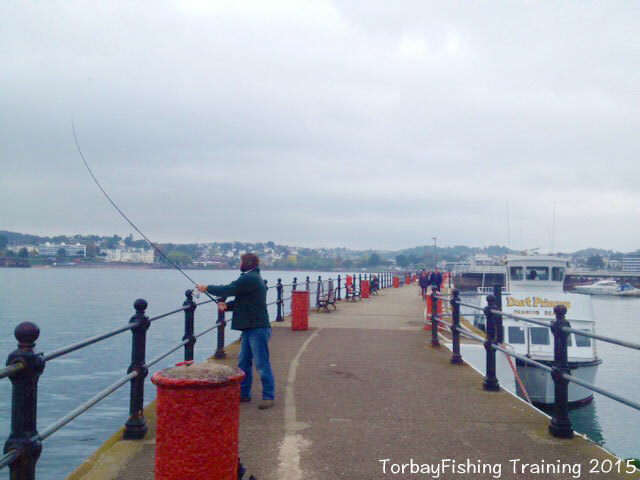 Whilst Torbay Fishing will make attempts to safeguard you from such dangers, accidents and injuries can happen. In agreeing to take part in this activity you agree to this disclaimer, acknowledge these dangers and agree to take part entirely at your own risk.